A ronin happens across a village suffering at the hands of a greedy governor. Finding a house of three farmers who have kidnapped the governor’s daughter as a bargaining chip he decides to help. One farmer’s daughter has also been taken by the governor, leading to a stalemate. The ronin is joined by two rogue samurai from the governors guard. Various conflicts ensue as the situation becomes increasingly violent. The film is based on a long running T.V. series and as such is packed with incident as the characters struggle and scheme against each other. As such the film moves rapidly from one set-piece to another, feeling like a round-up of a series rather than a story which has time to breath. 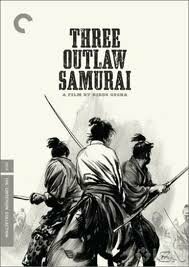 It’s well-shot, in black and white, with plenty of sword-fighting and not a little melodrama. Occasionally it feels cheap compared to other films of the period. Not for the faint-hearted, the film actually gets surprisingly violent and the treatment of the daughters is fairly shocking. Violence begets violence is the moral at the heart of this film. The ronin character is played as a hero rescuing the villagers, but their treatment of the daughter is of cause for concern. To what extent should conflict be allowed to escalate. A fast-paced action story with a few powerful scenes which you will remember.